Are you ready for spring? We are deep into winter and I think people are already looking ahead to warmer weather and blooming flowers! This Weight Watchers Triple Berry Crisp makes me think of spring because of the pretty colors and the fresh fruit. Sometimes we need a dessert and finding a good Weight Watchers recipe that anyone will love is awesome! I love berries. They make a great snack. Berries are full of amazing nutrients. So although this recipe is a dessert….it actually has a lot of goodness inside! Eating more fruit is always a priority with me and between this recipe and my Weight Watchers Fruit Salad recipe…it is easy to get enough! 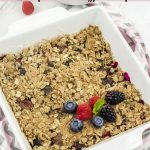 Plus this Triple Berry Crisp is perfect for taking to family get togethers and parties. Spray 8 x 8 or 9 x 9 baking pan with nonstick spray . To make topping: stir together all topping ingredients in medium bowl until moistened. Squeeze mixture together to form loose ball, then break into small pieces and sprinkle evenly over filling. Bake until filling is bubbly and topping is golden, about 20 min. loosely covering crisp with foil to prevent over browning if needed. I cut this Weight Watchers dessert into 9 pieces and each one is 5 Freestyle SmartPoints. I like to add some fat-free Cool Whip or whipped cream on top…but don't forget to count those points! Have You Heard of Antique Farmhouse? These breadboard chalkboards are perfect for writing sweet messages on or even whats for dinner. A two-tier wire basket with wooden handles would look perfect on the table filled with fresh fruit. Who wouldn't love this big embossed EAT sign for their kitchen. I have just the spot to hang this too. Let me know how you like this dessert!! What are your plans for spring? 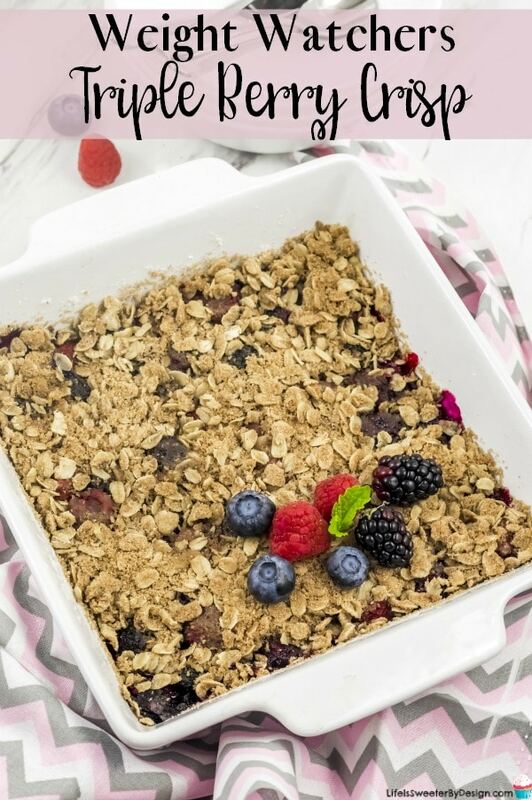 This Weight Watchers Triple Berry Crisp is a delicious Weight Watchers dessert recipe and full of healthy berries! Plus it is easy to make. Spray 8 x 8 or 9 x 9 baking pan with nonstick spray. I cut this into 9 squares and each piece is 5 Freestyle SmartPoints. I like to add some sugar-free Cool Whip or whipped cream to the top...but be sure to count those points!